The Vatican announced Dec. 19 that the pope had accepted Bishop Salazar’s request for early retirement. The announcement came two weeks after the Archdiocese of Los Angeles released an updated comprehensive list of sexual misconduct allegations involving priests. 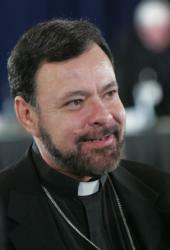 According to the archdiocese, Los Angeles Archbishop Jose H. Gomez requested and received permission from the Congregation for Bishops in Rome for the archdiocese’s independent lay oversight board to review an allegation against Bishop Salazar of misconduct involving a minor dating back to the 1990s. Bishop Salazar has consistently denied any misconduct or wrongdoing. The archdiocese confirmed that the allegation against the bishop was never prosecuted and that it knows of no other such allegations against him since his ordination to the priesthood in 1984. Born in Costa Rica in 1949, Bishop Salazar grew up in Los Angeles after his family moved to the U.S. when he was 3 years old. He graduated from local Catholic schools and after 10 years as a high school teacher, he studied for the priesthood at St. John’s Seminary in Camarillo. In a 2004 interview with The Tidings, the former archdiocesan newspaper of Los Angeles, before his episcopal ordination, Bishop Salazar recalled that his experience as an extraordinary minister of holy Communion while teaching at St. Albert the Great School in Compton, reawakened a childhood desire to consider the priesthood. Following his ordination to the priesthood, he served in several Los Angeles-area parishes before being named vice-chancellor for the archdiocese in 2003. Since being ordained a bishop in 2004, Bishop Salazar has served at different times as vicar for the San Pedro Pastoral Region, vicar for Ethnic Ministries and head of the archdiocesan Office of Justice and Peace. Throughout his priestly career, Bishop Salazar has been known as an advocate for the poor and immigrants. Two years before being consecrated a bishop, he had been the subject of an investigation by the Pasadena Police Department. An adult male had come forward to police alleging sexual misconduct by Bishop Salazar when he was a minor in the 1990s. At the time, the bishop was serving as associate pastor at Assumption of the Blessed Virgin Mary Church in Pasadena. Pasadena Police investigated the allegation, found it to be credible and recommended that the District Attorney pursue prosecution. However, the District Attorney’s office did not file charges in the case. At the time, the archdiocese was not notified of the investigation by either Pasadena Police or the District Attorney. The archdiocese was informed of the allegation and police investigation in 2005 through a third party. Cardinal Roger M. Mahony, then archbishop of Los Angeles, requested a full review of the case with law enforcement officials. Because the allegation concerned a bishop, Cardinal Mahony also immediately took the matter to the Vatican’s Congregation for the Doctrine of Faith. The congregation conducted its own probe and as a result, “certain precautionary measures on the ministry of Bishop Salazar” were imposed, Archbishop Gomez said in his Dec. 19 letter. Archdiocesan officials told Angelus News that since succeeding Cardinal Mahony in 2011, Archbishop Gomez has continued to follow the conditions imposed by the Holy See on Bishop Salazar’s ministry and has remained in regular contact with Vatican officials regarding his status. This fall, as the Los Angeles Archdiocese prepared to update its “Report to the People of God,” which lists the names of priests credibly accused of sexual abuse or misconduct, Archbishop Gomez felt it was important to revisit the old allegation against Bishop Salazar. In his Dec. 19 letter, Archbishop Gomez explained that he asked for and received permission from the Congregation for Bishops to submit the Bishop Salazar allegation to the archdiocese’s independent Clergy Misconduct Oversight Board. According to the archdiocese, the board reviewed the allegation under the same standards applied to priests and deacons. It found the allegation credible and recommended that Bishop Salazar have no faculties to minister. Archbishop Gomez submitted the board’s findings and recommendations to the bishops’ congregation in Rome. The Bishop Salazar case joins two other recent cases involving old allegations against U.S. bishops that date to the time when they were priests. In the cases of New York Auxiliary Bishop John J. Jenik and Archbishop Theodore E. McCarrick, Rome granted permission to Cardinal Timothy M. Dolan to submit both cases to his archdiocese’s independent lay oversight board. Both men were accused of misconduct during their time as priests of the Archdiocese of New York. Some canon law experts told Angelus News, the news outlet of the Archdiocese of Los Angeles, that these recent cases may signal a new moment in the way Rome handles allegations against bishops. To date, the church’s approach has put metropolitan archbishops like Archbishop Gomez and Cardinal Dolan in an “impossible situation,” according to Catholic University of America canon law professor Kurt Martens. Nick Cafardi, former head of the U.S. bishops’ National Review Board, told Angelus News that recent cases highlight the need for church leaders to clarify procedures in penal proceedings against bishops. Archbishop Gomez also expressed gratitude for Rome’s cooperation and care for victims of abuse, thanking Pope Francis for his “loving concern for the family of God here in the Archdiocese of Los Angeles” in his Dec. 19 letter. It will be a very long time for any healing or reconcilliation to have any meaningful effect especially knowing that Salazar has made it to “retirement”. How was he selected to the episcopacy after information surfaced? Though not every bishop was considered negligent, the overall history is abysmal. The largest point evoking anger is that it continued after 2002! Philadelphia didn’t listen to me in 1966. I don’t believe bishops care as much about healing as they do about settlements. Rank has its privilege!!!! if it was credible why wasn’t he removed like an average priest.